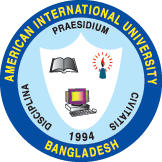 On the third year of its ISO 9001:2008 Certification Status which was granted by SGS-UKAS in 2014, the American International University-Bangladesh (AIUB) has maintained once again this prestigious award after a thorough surveillance audit with flying colors. It has proven once again that the scope: Quality Management Operation System for the University has complied with the international standards prescribed by the SGS-UKAS, certification body based in Switzerland and United Kingdom. The two-day surveillance audit, 28-29 September 2016, was carried out with the following activities: perusal of vital documents, interview with the key nonacademic officers, ocular visit with the different physical infrastructure, inspection of safety measures and other facilities. The surveillance audit focused more on the customer satisfaction and services, documentation and records control, operational activities, work environment, identification and evaluation of legal documents, communication, responsibility and authority, procurement process, design and development activities. The preparation and alertness of the IQAC Team headed by its Director, Prof. Dr. Charles C. Villanueva, the nonacademic officers headed by the university Registrar, Prof. M.A. Quaiyum, the Academic and nonacademic Directors, Deputy Directors, and other officers of the different programs, offices and campuses made the surveillance audit smooth and substantive. In general, there was no major nor minor nonconformity. There were a couple of observations and positive suggestions which are well accepted. The SGS-UKAS Surveillance Audit Team composed of Mr. Shabab Ahmed Mahfuz, Chief Auditor and Ms. Farjana Ahmed, Senior Auditor congratulated the AIUB Team during the final wrap up. The success of this undertaking is attributed to the strong support of the management and its adherence to quality and excellence of both the academic programs and services headed by the Honorable Vice Chancellor, Dr. Carmen Z. Lamagna, Mr. Isthiaque Abedin, Founder and Chairman of the Board of Trustees, Dr. Hasanul A. Hasan, Founder and Treasurer, VP HR and Administration, and Ms. Nadia Abedin, Founder and VP Student Affairs.